For more advice on fishing the American River Fly Fishing, check out the books below. The Lower American River runs 23 miles from semi-rural Folsom Lake to downtown Sacramento, where it enters the Sacramento River. It is a rather picturesque medium/large-sized urban fishery with multiple steelhead runs and, according to some, resident year-round rainbows. The river emanates as a bottom release from Folsom Dam, which creates Folsom Lake. The Lake receives cold, clear water from the North and South Fork of the American Rivers as they drain the area just west of Lake Tahoe. From Folsom dam, the river runs about 2 miles through a narrow chasm past Folsom Prison and then into Lake Natoma in the town of Folsom, where the state record rainbow trout was caught. This chasm area is not fished much, due partly to the difficult cliff-like access. Lake Natoma is a long, skinny, shallow reservoir formed by top release Nimbus Dam. From Lake Natoma, the river spills into a large pool, then a fish screen spanning the river (to encourage fish to go up the fish ladder for the hatchery), then immediately past Nimbus Hatchery, which focuses on the steelhead and salmon that run up the river each year. From there, the fly fishing water extends 8 miles through long glides, riffles, deep pools, around the occasional island, and through a few rapids to Howe Avenue. Below Howe, the river flattens considerably as it makes its way to the Sacramento River and is not well-suited for fly fishing. The Lower American also has significant runs of salmon, stripers and shad. Access to the American is a piece of cake for wading and boat launches, and there are almost too many access points to mention. From Nimbus Dam, the river parallels Highway 50 most of the way until it veers away and heads to the Sacramento River. Thus many of the access points are named by the corresponding exits from the highway. Begining from Nimbus Dam, access points include: Nimbus Hatchery, Sailor Bar (at Hazel Avenue), Sunrise Avenue, El Manto, Rossmoor Bar, Ancil Hoffman Park, Hagan Community Park, Sarah Court, Goethe Park (renamed River Bend Park), Rod Beaudry Road, Williams Pond Recration Area, Paradise Beach, Gristmill, Watt Avenue and Howe Avenue. Floating the river in a drift boat, pontoon boat or canoe is also popular. You can estimate your drift time here. The primary steelhead runs include late summer and early fall runs of "half-pounder" steelhead that average 12-14 inches but can exceed 20 inches. These fish are best caught on caddis patterns, as caddis predominate in the Lower American. However, egg imitations can work as well once the salmon penetrate the system and begin spawning in late fall and early winter. On cloud days, Blue Winged Olives can also produce success. Perhaps the main attraction is the winter run of the big, strong Eel River strain steelhead that average 6 to 10 pounds and can exceed 20 pounds. Standard steelhead techniques such as swinging streamers or steelhead flies or swinging/drifting nymphs and eggs will work. The winter runs typically goes from December through March. It is during this time that the American draws its biggest crowds. One hook-up with a poweful winter run steelhead on the Lower American and you'll understand why. The last "run" (a much smaller one) is of the "blueback" steelhead in February and March. Finally, "steelhead" or rainbow trout -- a topic of debate -- can be caught almost any month of the year. Whether these are steelehead that linger or enter the system at random times, or trout that find the water cold enough to survive summer (or that have found an area with cold springs), is a matter of debate. In the end, though, who cares if you can fish for them? Because of its location in California's Central Valley, the Lower American River can be fly fished year-round. Temperatures in the summer are in the 90's and 100's, with clear blue skies virtually every day. During this time you will encounter large numbers of rafters and tubers, since the weather is hot and the river is ideal for all kinds of recreational uses. Therefore, the best time to fish in the summer is early morning and late evening (which are when you'd have your best fishing anyway). In the winter, it rains an average of 20 inches a year, and is often cloudy. Temperaturers average in the 50's by day and 30's by night, and snow is not a concern. Fall and spring are transition periods when temperatures can be close to ideal. 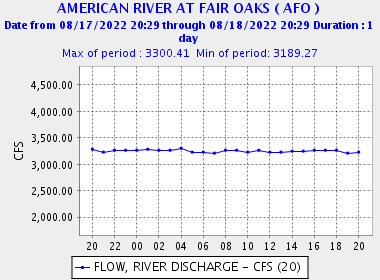 Flows of 2000 CFS are ideal, but it gets tricky above 3000 CFS. Check the local flowsbefore heading out. People drown on this river every year, so be careful.